The toolbox is a game design engine on Gamestar Mechanic that allows you to build great games and add sprites quickly. After you become familiar with its simple format, you can immediately start designing your own games. Click on a sprite in the sprite tray on the left. The orange drop-down menu allows you to select sprites of a certain genre. The five buttons labeled Avatar, Enemy, Block, Item, and System allow you to look at sprites with a particular purpose. Use the gray View All Sprites button to close all filters. 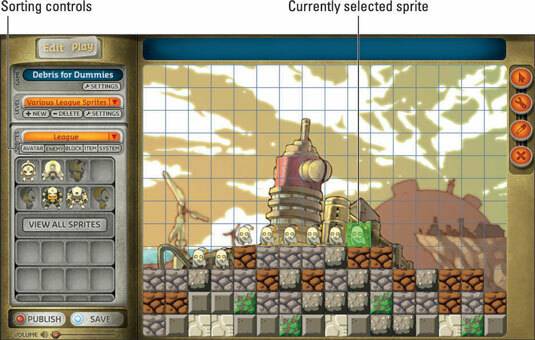 On the grid, click the square where you want the sprite to go. The square glows green if available; a red square means another sprite is in the way. Place more sprites on the grid if you want. You can repeat Step 2 to place multiple sprites, or simply click and drag over many squares to place the same sprite in all those squares. Put the sprite away by clicking in an empty spot on the sprite tray. The sprite disappears from your cursor when you click its place in the sprite library. By placing many sprites on the field, you can design rooms, mazes, gauntlets of villainous sprites, and any sort of challenge you can think of. If the name of a sprite in your library appears grayed out, the sprite has a bad sprite perspective.